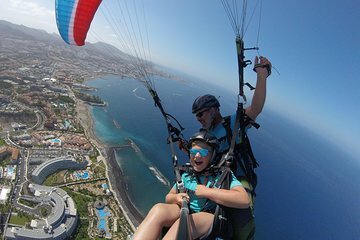 See panoramic views over Tenerife with this tandem paragliding experience. Soar in thermal currents at a height of up to 1,000 meters during this flight. Choose between leaving the piloting to your instructor and trying your hand at piloting the glider. Admire views of Barranco del Infierno, Roque del Conde, and Playa de la Americas before landing on Playa de la Enramada Beach. On paragliding flights, the temperature can get pretty cold, so dress in comfortable clothes and bring a sweater or jacket in case it is cool. Please also wear sports shoes/ sneakers and bring a windbreaker jacket. Depending on the weather, you may also want to bring sunblock, sunglasses, a hat and some water. If you are excessively prone to seasickness, you may wish to take anti-sickness medication. In case of adverse weather, the local tour operator reserves the right to reschedule the flight for another day/ time or to cancel the flight. The weight of the passenger may not exceed 100 kilograms. The minimum age to fly is 6 years and children under 18 must be accompanied by a guardian.